Homophobia has a way of rearing its ugly head from time to time. While progress has been made in this area of slowly, but surely, no longer regarding homophobia as ‘cool’ or ‘manly’ – apparently some on social media have not received the memo that the year is 2018 and about to be 2019, not 1988 about to be 1989. Earlier this week, Twitter and Instagram lit up when word of salacious allegations against the Washington Wizards’ Dwight Howard surfaced. They center around an alleged consensual relationship with a man named Masin Elije. The person claimed sexual harassment and threatening by Howard. Who knows if or if not the allegations are true. There have been tweets put out by users that are claiming Elije is simply looking for attention and that Elije has put out false accusations against other celebrities. What stuck out to me and plenty of others was the wave of homophobic tweets and posts – by predominantly cisgender men — that were put out in response to the news. As far as we have come in recognizing that Love is Love regardless of who it is with, homophobia and transphobia are still things in 2018. The reaction highlighted two things – that outside of those such as Jason Collins and Michael Sam, men’s sports, predominantly run by cisgender men, still has a problem with accepting gay and bisexual men as people even though there is a likelihood that at least one player on every NBA, NFL, NHL, and MLB team identifies himself as gay or bisexual. Second – despite all the progress, it is also something that the African-American community still has to deal with as well. The idea of the gay or bisexual man flies in the face of the hyper-masculine stereotypes that have been unfairly bestowed upon black men. Both the NBA and WNBA have positioned themselves as the progressive sports leagues of today. While the NFL still has not bestowed a quarterback job to Colin Kaepernick and MLB donated money to an openly racist Senator-elect out of Mississippi, the NBA and WNBA outwardly have taken the lead in being more progressive and open-minded than some of its other sporting brethren. With a clear difference as the Dwight Howard reaction tells us – the NBA talks the talk, but the W walks the walk. There is a litany of openly gay players within the W’s ranks. 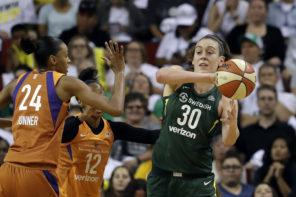 From Sue Bird, to Elena Delle Donne to Layshia Clarendon to Seimone Augustus to Rebekkah Brunson to Stefanie Dolson and others, there is no inclusivity problem within the WNBA. When a WNBA player reveals herself as LGBTQ, the reaction from W Twitter is almost entirely one of love and congratulations. The WNBA already has a prominent standing within the LGBTQ community as it is – one that is only enhanced by more players ‘coming out’ as well as participating in Pride events as well as Pride week. It is also, as we all know, a key reason as to why the W continues to attract so many haters and trolls on social media. 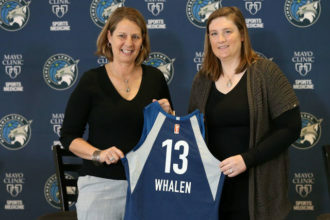 Look at any number of negative posts on Twitter or IG in regards to the league and its players and an obvious homophobic – as well as sexist – knock they peddle is that most WNBA players look like men. That is, of course, code for saying why doesn’t the stereotypical WNBA player resemble something more becoming of….the Dallas Cowboys cheerleader – uniform and all. 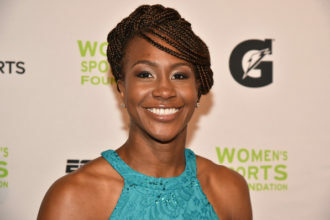 Firstly – as we at Beyond The W have done plenty of work spotlighting, there are a number of WNBA players from Cappie Pondexter to Skylar Diggins-Smith to Betnijah Laney to Crystal Langhorne to the Ogwumike sisters to even former Chicago Sky coach Amber Stocks that have partaken in activities and events off the court that are more ‘traditional’ gender roles for women. Diggins-Smith herself has let it be known that she has no problem with being a ‘beauty’ off the court and a ‘beast’ on it. I love being strong and being fierce intense and in my competition and being able to excel on the court, but also being able to mix it up and to wear a different hat and, you know, to put that makeup on or put heels on or put a dress on. Secondly – who cares what a WNBA player looks like. All that matters is that they can ball and there is plenty of world-class talent on all 12 teams. Also, put any model or cheerleader in a game and chances are they will be so worn out by the fierce competition they will not be exactly for their next shoot by the time the scoreboard hits the triple zeroes. 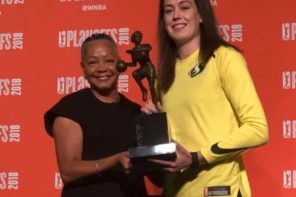 The sexist and homophobic remarks leveled at WNBA players also has grounds in the W itself bucking the gender norm of what a woman is supposed to do on society. Let’s be honest – it is a major facet of why women get held back while men continue to obtain so many opportunities through sports – women are not supposed to play sports because it does not look ‘ladylike’ for a woman to defy traditional gender roles. Gender roles that men put in place for women. The thing that scares a lot of insecure, cisgender dudes the most is that WNBA players and the league itself has no problem embracing its inclusiveness. While other leagues only shy away from it, or only pay it cheap lip service, the WNBA actually takes the lead in pushing for not only LGBTQ love, but LGBTQ equality.